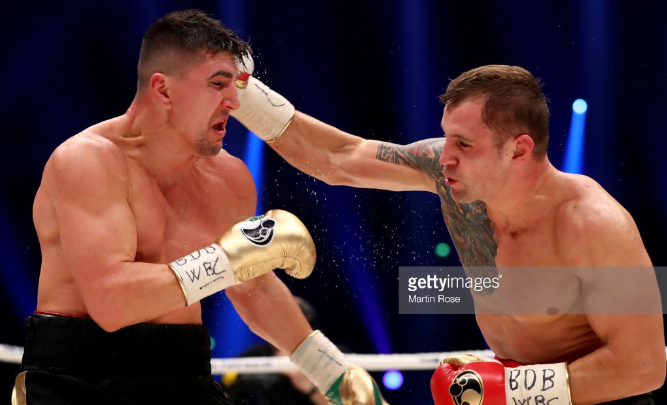 – In a battle of top 10 cruiserweights, Ring Mag #7 Mairis Briedis won a 12 rd UD over #6 Marco Huck by the scores of 118-109, 117-110 & 116-111 for the vacant WBC Title on April 1st at the Westfalenhalle in Dortmund, Nordrheim-Westfalen Germany. The bout was fairly nondescript, with Briedis using movement to counter Huck’s aggressive style. Briedis had his 7 fight KO streak end as he’s now stopped 10 of his last 12 foes. The title became vacant after Tony Bellew was elevated the Champion Emeritus status after moving up to heavyweight and it’s not known at the moment what weight class he will be fighting at as of this writing. – Ring Mag #2 Jr Welterweight Antonio Orozco stopped unrated, but undefeated Keandre Gibson at 1:31 of the 4th round on April 1st at the Cosmopolitan in Las Vegas, NV. A right hand to the jaw dropped Gibson and referee Russell Mora ruled Gibson unable to continue after rising. This was Orozco’s 1st fight since a 10 rd UD over Abner Lopez last July. He was scheduled to take on Fidel Maldonado last Dec, but the fight was cancelled when he fainted while attempting to make wight. This was the 1st time Orozco made the 140 pound limit since 2010! 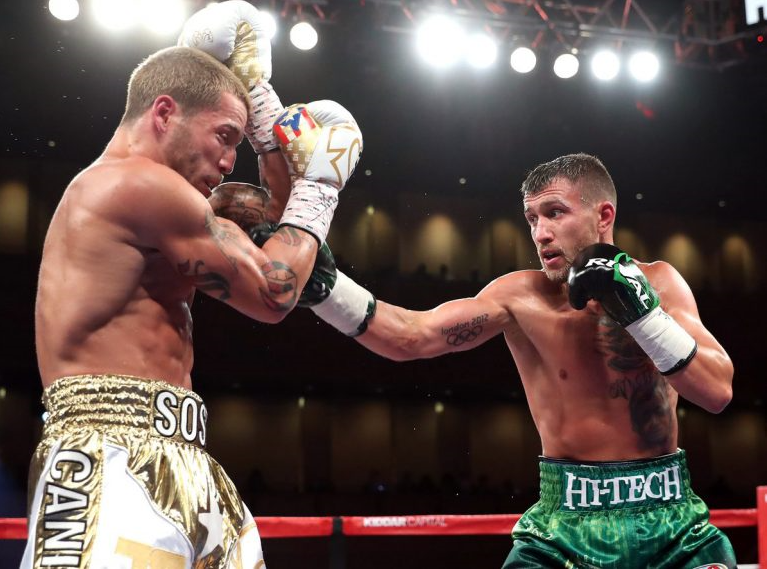 – In a battle of top 10 contenders Ring Mag #6 lb 4 lb, #1 Jr Lightweight & WBO champ Vasyl Lomachenko successfully defended his title for the 6th time after stopping #10 Jason Sosa when Sosa’s corner wouldn’t allow him to come out for the 10th round on April 8th at MGM National Harbor in Oxon Hill, MD. There were no knockdowns, but Lomachenko dominated from the outset, swelling Sosa’s left eye in the 3rd round. Sosa showed a tremendous amount of heart in the loss and he never stopped bringing the fight to Lomachenko, who won his 7th straight. Sosa had his 20 fight unbeaten streak snapped. Lomachenko was expected to originally unify against WBA champ & #3 rated Jazreel Corrales, but Corrales team couldn’t come to terms, assumedly because they would be a huge ‘dog. – On the undercard of Lomachenko/Sosa, Ring Mag #1 & WBO Cruiserweight Champ Oleksandr Usyk successfully defended his title for the 2nd time with a 12 rd UD over undefeated, but unrated Michael Hunter with all 3 judges turning in identical scorecards of 117-110. The bout was close early on, with Usyk taking control in the 2H of the fight. The ropes held Hunter up in the final round and ref Bill Clancy correctly ruled it a knockdown. Usyk went the distance for just the 2nd time in his 12 fights as a pro. – Also on the undercard of Lomachenko/Sosa, Ring Mag #8 Light Heavyweight Oleksandr Gvozdyk stopped unrated Yunieski Gonzalez at 2:55 of the 3rd round. Gvozdyk was dominant from the start, scored a knockdown in the final round and then the follow up prompted Gonzalez’s corner to stop the bout. Gvozdyk has now stopped 10 of his last 11 foes incl 7 straight. – In a battle of top 10 lightweights, Ring Mag #2 & WBO champ Terry Flanagan successfully defended his title for the 5th time over #10 Petr Petrov by 12 rd UD with the scorecards reading 120-108, 118-110, & 116-112 on April 8th at the Manchester Arena in Manchester, England. There were no knockdowns as Flanagan won a tactical match. Flanagan has now gone the distance 3 of his last 4 bouts. Petrov’s loss snapped a 6 fight win streak. 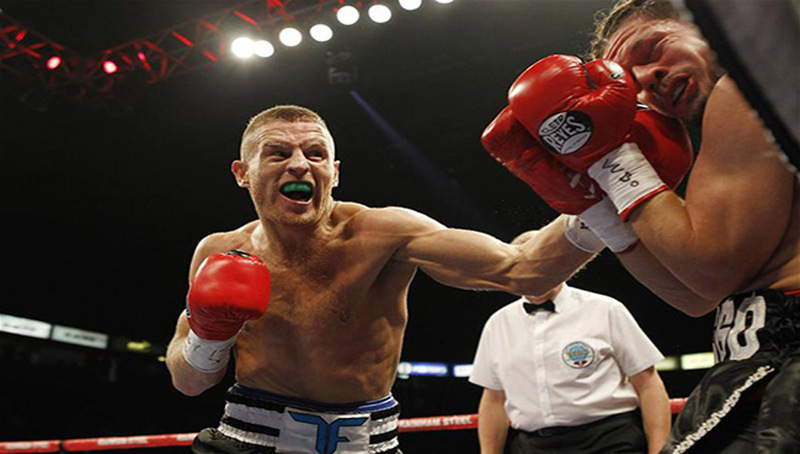 – On the undercard of Flanagan/Petrov, Ring Mag #8 Jr Middleweight Liam Smith stopped undefeated, but unrated Liam Williams when Williams failed to come out for the 10th round following a severe cut from a headbutt in the 9th round. The referee didn’t stop the fight, so it was deemed a TKO win. Smith was cut from a punch in the 3rd round and Williams had a 1 point lead on all 3 judges scorecards at the time of the stoppage. The bout was intended to be for the interim WBO Jr Middleweight title, but Smith came in overweight and the title was on the line only for Williams. – Ring Mag #9 Middleweight Maciej Sulecki stopped unrated Michi Munoz at 1:01 of the 3rd round on April 8th in Zakopane Poland in his 1st fight in the Jr Middleweight division. Sulecki scored 2 knockdowns in the 2nd round before ending matters in the 3rd. Sulecki has now scored 6 straight stoppages. The week after his fight he was dropped from the Middleweight rankings as he will now campaign in the Jr Middleweight division. – 4/14 Ring Mag #5, four time Strawweight World Champion and current WBO champ Katsunari Takayama announced his retirement. Interim WBO Champ Tatsuya Fukuhara has been promoted to full Champion. 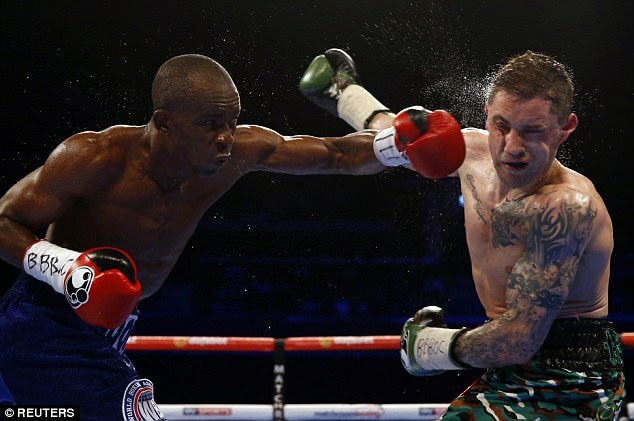 – In a unification battle of top 10 Jr welterweights, Ring Mag #7 & IBF Champ Julius Indongo dominated #5 & WBA champ Ricky Burns en route to a 12 rd UD by the scores of 120-108, 118-110 & 116-112 on April 15th at the SSE Hydro in Glasgow, Scotland. There were no knockdowns, but Burns was effected by the power shots landed by Indongo. It was his 1st defense and the decision win snapped a 3 fight KO streak. Burns had his 4 fight win streak snapped. – Ring Mag #9 Light Heavyweight Sullivan Barrera stopped unrated Paul Parker at 2:08 of the 5th round on April 15th at the Mohegan Sun in Uncasville, Ct. Barrera scored 2 knockdowns in the 5th and then a follow up barrage nearly floored Parker again before the referee stopped the bout. Barrera now has B2B stoppages since his lone loss, a 12 rd UD to current Ring Mag #1 Andre Ward. His last 8 wins have all come by KO. He was originally set to face fellow Top 10 contender Artur Beterbiev, but unexpectedly pulled out of that fight. – 4/21 Nick Durandt, who trained and managed the most World Champions in South African history, died in a motorcycle accident. He was 53 yrs old. – Ring Mag #5 Flyweight Juan Carlos Reveco won a 12 rd UD over unrated Jesus Vargas by the scores of 120-108 twice & 120-110 on April 21st in Argentina. Reveco has now won 3 of 4 including B2B since his last loss, an 11th rd KO by Kazuto Ioka for the WBA Flyweight title in ’15. – Ring Mag #8 Middleweight Avtandil Khurtsidze handed unrated Tommy Langford his 1st loss after stopping him at :27 of the 5th round for the interim WBO title on April 22nd at the Leicester Arena in Leicestershire, UK. Khurtsidze scored a knockdown after a left hand upstairs. Langford got to his feet, but was in no shape to continue. Khurtsidze has now scored 6 straight knockouts in his 10 fight winning streak and is in line to take on Ring Mag #4 & WBO Champ Billy Joe Saunders. – On the undercard of Khurtsidze/Langford, Ring Mag #8 Bantamweight Zolani Tete won the vacant WBO title with a 12 rd UD over unrated Arthur Villanueva, by the scores of 120-107 and 119-108 twice. Tete scored a knockdown in the 11th round and was never in trouble during the contest. He’s now won 9 straight and 10 of 11. This was just his 2nd fight to go the distance in his last 6. The bout was originally scheduled to be an eliminator but was elevated after WBO Champ Marlon Tapales was stripped of his title for failing to make weight and then won his fight, thus making the title vacant. – Ring Mag #8 Super Middleweight Arthur Abraham won a 12 rd UD over unrated Robin Krasniqi on April 22nd at the Messe Erfurt Convention Center in Erfurt, Germany by the scores of 118-110, 117-111 & 115-114. There were no knockdowns as Abraham landed the harder shots. He’s now won 10 of 11 and becomes the mandatory challenger for Ring Mag #3 & WBO champ Gilberto Ramirez. – Ring Mag #3 rated Welterweight “Showtime” Shawn Porter stopped unrated Andre Berto at 1:31 of the 9th round on April 22nd at the Barclays Center in Brooklyn, NY. The fight was filled with numerous headbutts that left Berto cut over 1 eye and Porter badly cut over both eyes. Berto was dropped in the 2nd round as Porter was the aggressive fighter throughout and wouldn’t allow Berto to clinch. The ropes held Berto up following a right hand in the 9th round that the referee correctly called a knockdown and Porters follow up resulted in Berto staggering into the corner, prompting the referee to call a halt to the contest. With the win Porter becomes the mandatory challenger for Ring Mag #1, WBA & WBC champ Keith Thurman. Porter has now scored stoppages in 3 of his last 4 wins. – On the undercard of Porter/Berto, Ring Mag #3 Jr Middleweight & WBC Champion Jermell Charlo dominated unrated Charles Hatley en route to knocking him out at :32 of the 6th rd. Charlo scored a knockdown in the 3rd round after a right hand upstairs and finished things off in the 6th after a right hand to the chin dropped Hatley face first for the count. It was Charlo’s 1st title defense and fight in 11 months. He’s now scored 3 str stoppages. – Ring Mag #7 Featherweight and WBO Champ Oscar Valdez successfully made the 2nd defense of his title with a hard fought 12 rd UD over unrated Miguel Marriaga on April 22nd at the Stubhub Center in Carson, California by the scores of 119-108, 118-109 & 116-111. While Valdez was the clear winner, Marriaga was game and remained a viable threat despite the scores. Valdez scored a knockdown in the 10th roud from a counter left hook, but Marriaga rose and survived a follow-up attack to hurt Valdez near the end of the round, which will surely be a contender for ROY! Valdez had his 5 fight KO streak end, but has still stopped 8 of 10. – On the undercard of Valdez/Marriaga, Ring Mag #3 Super Middleweight & WBO Champ Gilberto Ramirez won a lackluster 12 rd UD over unrated Max Bursak with all 3 judges agreeing on a score of 120-106. The fight was as non-competitive as the score reflected and lacked action. Ramirez was coming off a year layoff due to a hand injury and made the 1st defense of his title. This was his 5th straight decision win. – Also on the undercard of Valdez/Marriaga, Ring Mag #2 Jr Featherweight & WBO Champ Jessie Magdaleno stopped unrated Adeilson Dos Santos at 2:51 of the 2nd rd. A right hook dropped Dos Santos in the 2nd round. He made it up and tried to hold on, but another knockdown prompted the referee to stop the bout. It was the 1st defense for Magdaleno, who has now stopped 3 of his last 4 opponents. – Ring Mag #5 Bantamweight Marlon Tapales stopped unrated Shohei Omori at :16 of the 11th round on April 23rd at the Edion Arena in Osaka, Japan. Tapales was set to defend the WBO title for the 1st time, but failed to make weight and was stripped at the scale, so the title was only on the line for Omori. The fight was very close as Omori had a 1 pt lead on all 3 judges scorecards after 9 rounds. Tapales scored a knockdown in the closing moments of the 10th round and ended things at the beginning of the 11th. Both suffered cuts above their eyes. This was a rematch from ’15, when Tapales won by 2nd rd TKO. Tapales has now won 22 of 23 including 9 straight. – On the undercard of Tapales/Omori, Ring Mag #1 Flyweight & WBA champ Kazuto Ioka made his 5th successful defense with a 12 rd UD over unrated Noknoi Sitthiprasert by the scores of 117-110 twice and 116-111. Ioka was dedected a point for a low blow in the 3rd round, but clearly outboxed the overmatched Sitthrprasert. Ioka had his 3 fight KO streak end, but won for the 8th straight time since his lone defeat. – Ring Mag #10 Strawweight Hiroto Kyoguchi won a 12 rd UD by the scores of 119-109, 118-111 & 117-111 over unrated Jonathan Refugio at Korakuen Hall in Tokyo, Japan on April 25th. Kyoguchi had stopped all 6 of his previous opponents. – Ring Mag #3 heavyweight Kubrat Pulev scored a 12 rd ud over unrated Kevin Johnson by the scores of 120-108 twice & 119-109 on April 28th at the Arena Armeec in Sofia, Bulgaria. Johnson did better than the scores indicated in the 1st half of the fight, but was punished from rd 10 on. Pulev has now won 5 straight since his lone loss to Wladimir Klitschko in 2014. 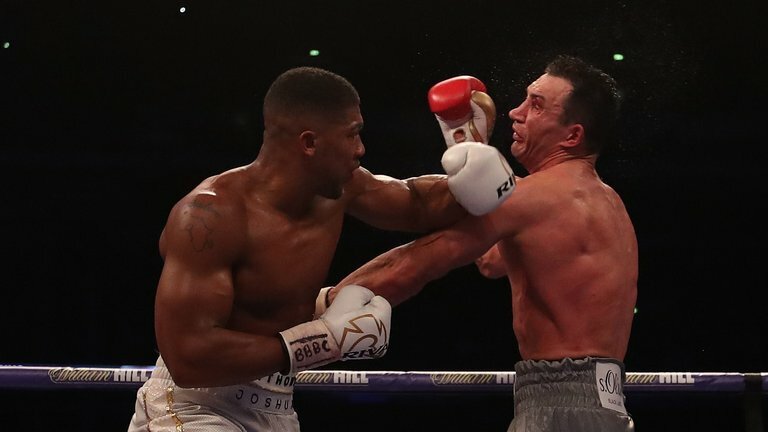 – In a battle of top 10 Heavyweights, Ring Mag #5 & IBF champ Anthony Joshua successfully made his 3rd defense while adding the vacant WBA title with an 11th rd TKO over #1 rated Wladimir Klitschko on April 29th at Webley Stadium in Wembley, London. Joshua scored a knockdown early in the 5th round, but tired himself up on the follow up and was nearly dropped by the close of the round. Klitschko did indeed score a knockdown in the 1st half of the 6th round and Joshua looked close to being out on his feet, but survived the round. Klitschko started to take over the fight from there until the 10th rd, when Joshua regained the momentum. The end came in the 11th when a massive uppercut shook Klitschko, who somehow stayed up but was dropped from a follow up just after. Upon rising he was dropped again, but showed true heart and grit and made it to his feet again. Joshua then pounced on him and trapped him in the corner where referee David Fields intervened and stopped the contest at 2:25 of the round. The scorecards at the time of the stoppage were 96-93 & 95-93 for Joshua, and 95-93 for Klitschko. An england record of 90,000 fans were in attendance. Joshua has now stopped all 19 of his foes and called out Ring Mag Champ Tyson Fury afterwards, however Klitschko does have a rematch clause. – Ring Mag #3 Flyweight Donnie Nietes became a 3 division champion after beating unrated Komgrich Nantapech in a 12 rd UD by the scores of 117-117 twice & 115-113 on April 29th at Cebu City, Cebu, Philippines for the vacant IBF title. The match was a hard fought affair as Nantapech was game until the end. Nietes is a former Strawweight and Jr Flyweight champion that has now won 27 of 28 including 9 straight since a 12 rd draw in ’13. Nantapech had his 15 fight win streak snapped. – Ring Mag #10 Jr. Lightweight Tevin Farmer won a hard fought 10 rd UD over unrated Arturo Santos Reyes by the scores of 98-94, 97-93 & 96-94 on April 29th at the Liacouras Center in Philadelphia, PA. Farmer appeared to injure his right arm early on and his trainer said he thought the bicep muscle was torn after the fight. With the decision win, 7 of Farmers last 8 fights have gone the distance, including 5 straight.